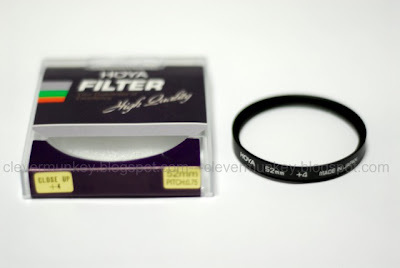 This is an Original Hoya Close up Filter. Its +4 diopters for close-up photography. Depth-of-field is shallow so use as small an aperture as possible, CLOSE-UPs offer a world of new creativity. They can be stacked to provide more magnification than if only one close-up filter was used. If you stack filters, the order you do so is important. Always put the strongest filter closest to the camera lens, then the next strongest, etc. 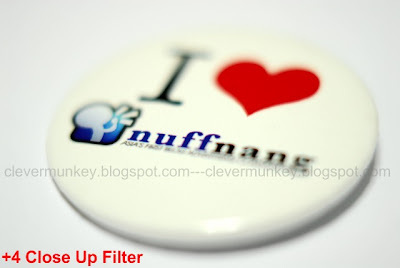 When using a standard filter and a close-up filter simultaneously, attach the close-ups first and the filter last. Suitable for any 52mm lens ring for all DSLR brand! Picture taken without close up filter using Nikkor 50mm f1.8. Picture taken with close up filter +4 using Nikkor 50mm f1.8.